I am so glad I came across this lovely dressmaker on Etsy! I consulted Sharmeen on the dress designs to make a tailor-made one for a little girl. She was spot-on to spontaneously come up with a perfect carousel& fairy-tale themed wrap dress upon giving her a brief description of this little girl. She updated me on the progress of crafting the beautiful dress. I enjoyed doing this transaction with her as she was pretty smooth& understanding! The entire ensemble of the baby blue dress with the gorgeous unicorns, castles, carriages, ribbons, & carousels was put together with her top-notch sewing skills! A sweet garnet colored waist-tie ribbon was sewed &it beautifully popped from the dress! Made the elements come alive! Impeccable sewing, excellent quality &truly one of a kind! The little girl absolutely loved her dress! Thank you! I am an Australian, currently living in Singapore. I absolutely love sewing and am passionate about creating dresses that have stories behind them. I spend many hours on each little dress, from choosing fabrics to sourcing the cutest patterns and finally to the actual construction of each garment. My aim is to create timeless quality pieces that will last through many seasons and be passed down from child to child, adding to the memories of each owner. Miss Marie Dresses are meant to be enjoyed and played in and not saved just for special occasions. Why do I sew dresses? When I was a child my grandmother and aunt took a lot of time and effort planning and sewing my outfits. I had the most beautiful clothes. When we get together, we still talk about my little wardrobe and it brings us so much joy! Now when I sew, I imagine a little girl wearing one of my creations and feeling very special and loved. As newly weds, we lived above a train station and right across the road was a little cafe called Miss Marie Cafe. The owner named it after his wife. My husband and I would have coffee there every morning before heading out to work. When I set up my Etsy store, I wanted to name it after this cafe. It's a place that holds a very sweet place in our hearts. I hope that you and your little girls enjoy these dresses as much I do. I look forward to any feedback or suggestions from you. Sharmeen is the owner and seamstress behind Miss Marie Dresses. She has been sewing for most of her life and is also a fabric addict! Thank you for visiting Miss Marie Dresses. I create one of a kind dresses for girls and dolls. 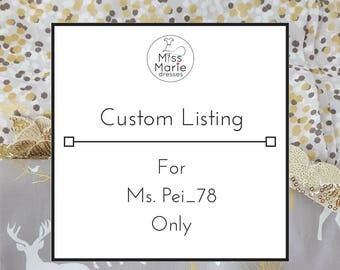 Purchasing from Miss Marie Dresses implies that you agree to the conditions below. Please feel free to contact me prior to making a purchase if you have any questions. Thank you! During a sale or promotion, coupon codes must be entered before the transaction is completed. If you need assistance inputting a code please contact me. No refunds will be given for discounts. In the event that we have mutually agreed upon a payment method other than PayPal, please ensure that payment is completed within 24 hours of sale. The sale will be cancelled and items restocked if payment is not made within 24 hours of sale. Please understand that if an order is already in production or completed, a cancellation will not be accepted. This means your order will be shipped as per the order and no refund will be given. Please read each item description CAREFULLY and use my measurement guides to measure your child before making your purchase. Handcrafted dress sizes can differ from ready to wear sizes. While I endeavor to be as accurate as possible, sizes and measurements are approximate and fabric patterns can vary depending on size and cut. Exact fabric color may vary from pictures due to camera, computer and monitor settings. Some dresses are photographed with a petticoat (not included) to show you its fullness. The age based sizing is only a starting guide. To help with fitting, every listing will also include measurements of the final garment. Read the entire description and check against your child. Please allow 2-3" inches of ease for comfort. Shipping costs include economy shipping, packaging and handling. I am not responsible in any way for lost, damaged, delayed or stolen packages. All orders are shipped by Singpost. Online tracking with scan status up to the dispatch of the item from Singapore to overseas is available to all destinations. Tracking information after dispatch from Singapore is subjected to the destination post’s availability. Once your order ships out, it is in the hands of the post office. Any inquiries involving shipping delays or deliveries can be directed to your local post service. International orders normally take 2-4 weeks to reach their destination, but can take up to 2 months. Packages shipped around holidays, may take longer to get to their destination. Unfortunately I am unable to provide rush shipping at this time and cannot guarantee that your dresses will arrive by any stated date. Please purchase dresses well in advance of special occasions. - Please be aware that items are considered a final sale and cannot be returned for refund. - Please select correct size when you purchase the dress. - Please understand that there is a color difference screen to screen when shopping online. - Please understand that I use 100% natural cotton fabrics. As such, from time to time there may be a slight discoloration on the print. This will not affect the wearing or overall aesthetic beauty of the dress. - Please ensure the shipping address is correct prior to placing an order. Etsy requires that I ship to the address as stated on the order receipt. - Please be aware of tax or custom fees that are a requirement of your country. I will refund if there is a sewing defect in the item. You must notify me within 48 hours of delivery. Any delay will assume your order is correct. Items must be unworn, unwashed and returned with original packaging within 7 days for a refund (minus original shipping & handling fees). If your return is postmarked after the 7-day return period, the package will be mailed back to you at your cost or forfeited and not refunded. Dresses are created by me in my smoke and pet free studio. I make dresses with children in mind and ensure that materials used are child-safe. However, please note that some dresses contain ties, ribbons, bows and similar attached features. By purchasing or modeling any items, you understand and agree that all items should be used with adult supervision and that you assume all responsibility for its use. Photos and designs of my products are the sole property of Miss Marie Dresses. Please do not copy in any way. Buyers in the EU have the right to the contact information of MissMarieDresses. This includes address, email and phone number. These details are only for the use of communication based on your order and are available upon request. Please note the USPS website is currently not functional for tracking incoming parcels from some countries including Singapore. Be assured, USPS internal tracking is still operational; however this is not a public interface. Once Singpost has shipped the parcel, I will update your order with a registration number. You will be able to track via the Singpost website up until the parcel reaches the US. USPS will take over the parcel and from that point tracking is not updated on their website. USPS can provide updates if you ring their helpline. You will need to ask to speak to an operator instead of using their automated tracking system. The consultant will track the parcel for you if you provide them with the Singpost registration number.